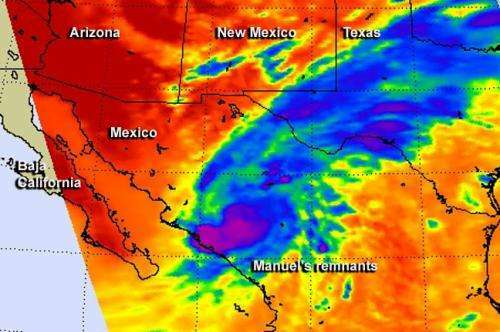 Two NASA satellites observed Hurricane Manuel as it made landfall in northwestern Mexico and brought rainfall into southwestern Texas. NASA's TRMM Satellite measured Hurricane Manuel's rainfall from space and found areas where it was falling as fast as 2 inches per hour. NASA's Aqua satellite captured both visible and infrared images that revealed strong thunderstorms associated with Manuel's remnants were streaming northeast into Texas. Those rains are expected to continue to soaking central Texas through Sept. 21. As predicted by the National Hurricane Center (NHC), tropical storm Manuel became a category one hurricane on Sept. 18. 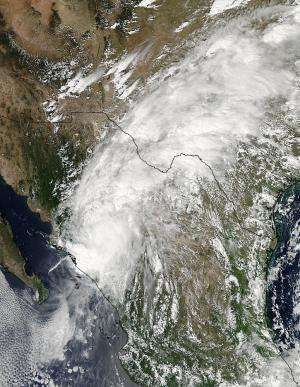 Manuel was an intensifying tropical storm that was located over the southern Gulf Of California with maximum wind speeds of about 50 knots/ 57.5 mph when the Tropical Rainfall Measuring Mission satellite called TRMM passed overhead on Sept. 18, 2013 at 1845 UTC/2:45 p.m. EDT. Manuel had intensified and was a minimal hurricane, hugging Mexico's coast, with wind speeds of about 65 knots/75.8 mph when seen again by TRMM on Sept. 19 at 0116 UTC/Sept. 18 at 9:16 p.m. EDT. At NASA's Goddard Space Flight Center in Greenbelt, Md. TRMM data was used to create a rainfall analyses. TRMM's Microwave Imager (TMI) and Precipitation Radar (PR) data were overlaid on visible/infrared satellite images of Manuel from TRMM's Visible and InfraRed Scanner (VIRS). 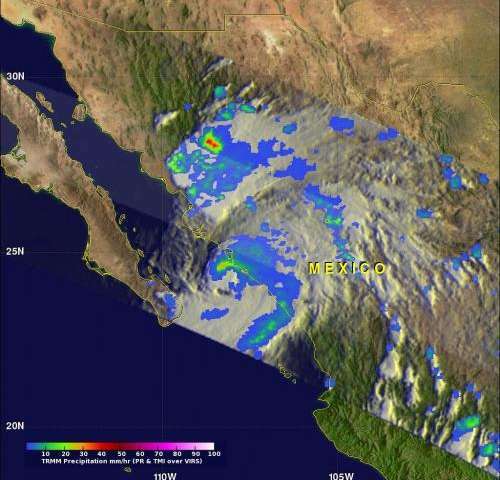 TRMM's TMI instrument provided the best coverage of Manuel during both orbits and found several areas of rain falling at a rate of over 50mm/2 inches per hour. NASA's Aqua satellite passed over Manuel on Sept. 19 at 20:15 UTC/4:15 p.m. EDT and the MODIS instrument aboard captured a visible image of the storm, while the AIRS instrument viewed it in infrared light. The Moderate Resolution Imaging Spectroradiometer or MODIS instrument's visible image of Manuel, clearly showed the center over northwestern Mexico, and associated clouds streaming into southwestern Texas. Meanwhile, the Atmospheric Infrared Sounder or AIRS instrument measured the cloud tops of those thunderstorms and found them to be as cold as -63F/-52C. Cloud tops in thunderstorms that cold have the potential to drop heavy rain. Warmer cloud top temperatures were seen in the stream of moisture moving into southwestern Texas, indicating cloud tops were not as high, and the uplift was not as strong. Manuel's extreme rainfall, with flooding and mudslides, caused extensive destruction in places such Acapulco near Mexico's Pacific coastline. On Friday, Sept. 23, 2013 at 4:23 a.m. EDT, the National Weather Service (NWS) in Austin/San Antonio, Texas issued a Flood Watch for south central Texas and the Hill country as a result of Manuel's remnants streaming through. The NWS noted that heavy rainfall was expected from Sept. 20 through Sept. 21 across south central Texas and the hill country. Manuel's remnants were providing a steady supply of tropical pacific moisture that are combining with deepening gulf moisture and an approaching cold front. Those factors are expected to bring widespread showers and thunderstorms to south central Texas on Sept. 20 and 21, according to NWS. Rainfall amounts of 2 to 4 inches are expected with isolated 6 inch amounts possible.